Congress later directed that an "unknown American" from subsequent wars, World War II, the Korean conflict, and the Viet Nam War, be similarly honored. With the development of DNA technology, the Unknown Soldier from the Viet Nam War was exhumed and identified. 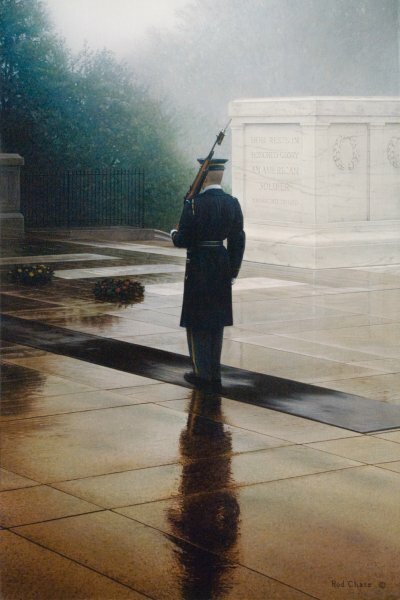 There may never be another unknown soldier. The changing of the guard ceremony is conducted every hour in winter and every half-hour in summer. All walks are two hours in duration after the cemetery is closed. As the active sentry nears the end of his walk, a uniformed relief commander enters the plaza to announce the changing of the guard. When the sentinel assigned the next walk leaves the Guard Quarters, he unlocks his M14 rifle to signify he is ready to begin the ceremony. The relief commander slowly approaches the Tomb, salutes, faces the visitors, and requests silence during the ceremony. As the new sentinel approaches, the relief commander slowly, and with great precision, conducts a white-glove inspection of the sentinel's weapon. The two men then march to the center of the black mat where the duty sentinel stops his walk. All three men salute the Tomb. The Tomb sentinels salute with their rifles held in front of them. "Pass on your orders," the commander instructs the active sentinel. "Post and orders, remain as directed," he replies. "Orders acknowledged," answers the relieving sentinel, who then steps into position at the center of the mat. As soon as the relief sentinel and relief commander pass, the new sentinel begins his walk: 21 paces south, turn and pass for 21 seconds, turn and pass 21 steps south, repeating the actions without distraction until relieved by the next changing of the guard.